FILTERED RIVER WATER. 1OO METRES. THE PLACE TO SWIM in the city. We have a vision to make it easy, enjoyable and safe to immerse ourselves in the Swan River in the city. As a team of local professionals with years of experience on significant projects, we are working to make this happen. The place to connect - to swim freely and safely in filtered, clear river water without chemicals, mud, jellyfish and algal blooms - year round, set in the amphitheatre of our beautiful city. Life in Western Australia centres around water – our aquifers, our beaches, our rivers. The River Deck will add to life in Perth. This is a unique opportunity for us to celebrate and embrace one of Perth’s most important natural resources, the Swan River. Western Australians have had a long and unique relationship with this water body – from its Indigenous origins as a place of food gathering, hunting, swimming and cultural ceremonies, through to European settlement and the development of the City Baths and the Crawley Baths, and now as a place where the city meets the water at Elizabeth Quay. 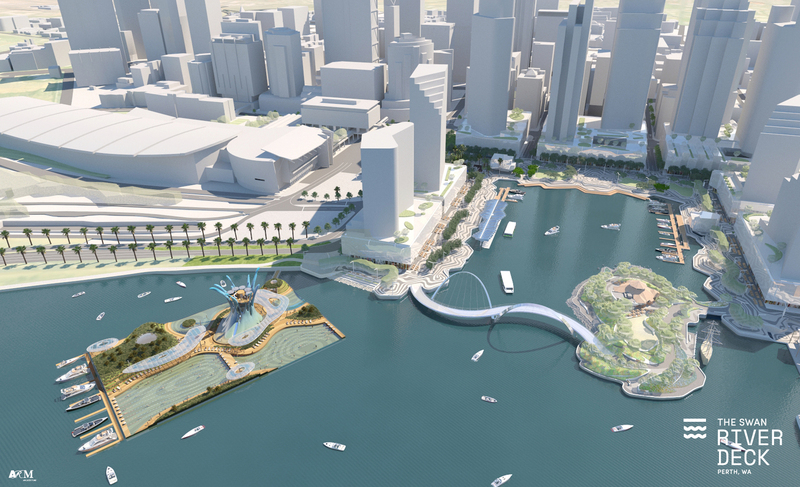 The proposed River Deck encapsulates this cultural and functional history of the river to offer a new way to interact with the river and a new destination. This destination will enrich Perth’s developing foreshore and add to its burgeoning night life. This is not just a place for swimming – it is a place to learn, meet friends, gather for events and enjoy performances. 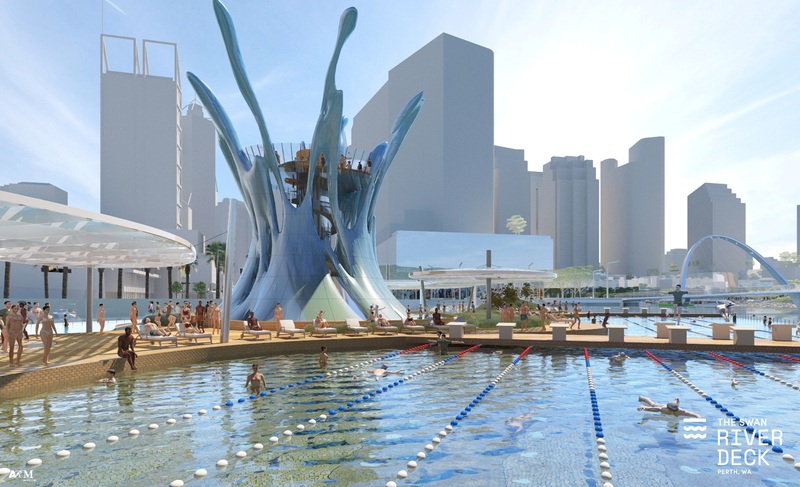 The Deck’s form and function are inspired by the Swan River’s unique morphology and the idea of water play. 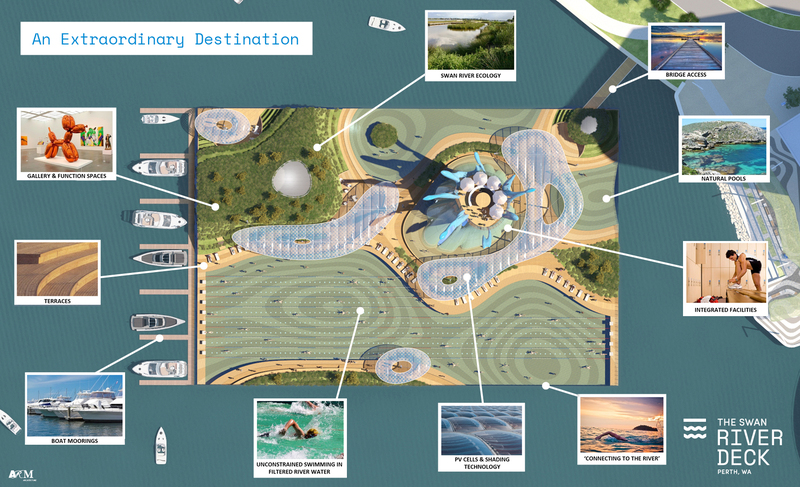 Designed as a lagoon connected to the river, its surface is generated by the inception of the splash, creating multiple water pools, a ‘sand-bar’ area to sunbake and to stay dry, and an ecological ‘habitat’ with rooms inside for events and exhibitions. The splash itself offers change-room facilities, as well as a unique viewing deck and bar within the crown – a new vantage point to view the city and the river from, which gives the deck an unmistakable profile to the city and its surrounds. The Deck will be a destination and place for the benefit of the people of Perth, bringing together local residents, city workers and visitors from all parts of the world and of all ages to immerse themselves in our beautiful Swan River. Close to public transport, it'll be easy to access for anyone any day of the year. 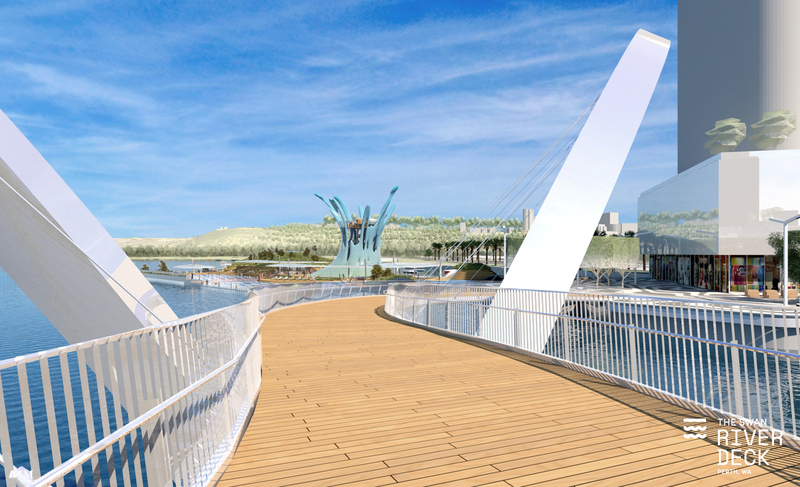 Designed as a contained lagoon that is connected to the river, the Deck will have filtered river water that is not chemically treated moving through it.  Oceanis has a plan for this, but we'll also be collaborating with Plus Pool in New York City, who have developed patented filtration technology. Swim freely! 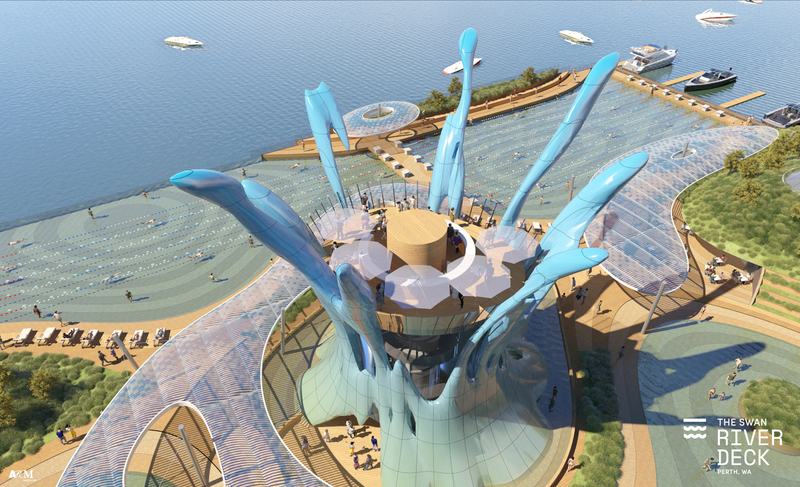 The Deck will have a 100 metre swimming length for safe 'open water' swimming, making it ideal for training to swim to Rottnest and unique on the world stage. We should have a swimming competition to find out who is the true 100m sprint champion of the world! Using a combination of solar, geothermal and heat exchanger technology, we could temper the water so that it isn't too chilly and can be swum in throughout the year. We'll minimise piling into the river bed by constructing the Deck as a barge that floats or rests on the river bed and is anchored in place. We want the River Deck to be beneficial for our environment by promoting the mixing and movement of river water around Elizabeth Quay, filtering out some of the bad stuff that is in the river and providing habitat areas for species such as Black Bream and Cobbler. We intend the Deck's design to embrace Indigenous cultural heritage. In the current concept, we have not presumed how these aspects might actually manifest. The Deck could integrate with, or be next to, the proposed Indigenous Cultural Centre. The Deck could offer primary and secondary school teaching opportunities, extra-curricular and tertiary ecology research/education programs e.g. snorkelling trails, fish breeding, wildlife monitoring, water body resilience, climate change, restoration ecology. 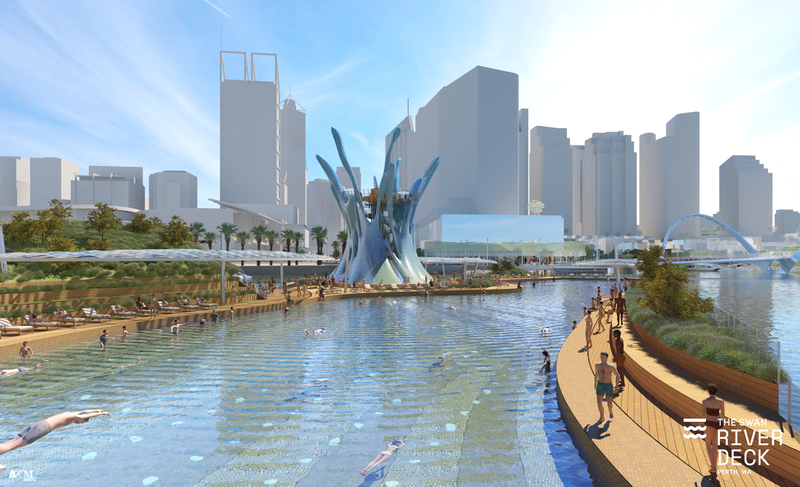 In the theme of Elizabeth Quay, the Deck could fuse the built and natural environments to create a stand-out destination in the amphitheatre of the city, and complement other attractions that the city, Elizabeth Quay and Kings Park have to offer. This will be something for which people will travel to experience. 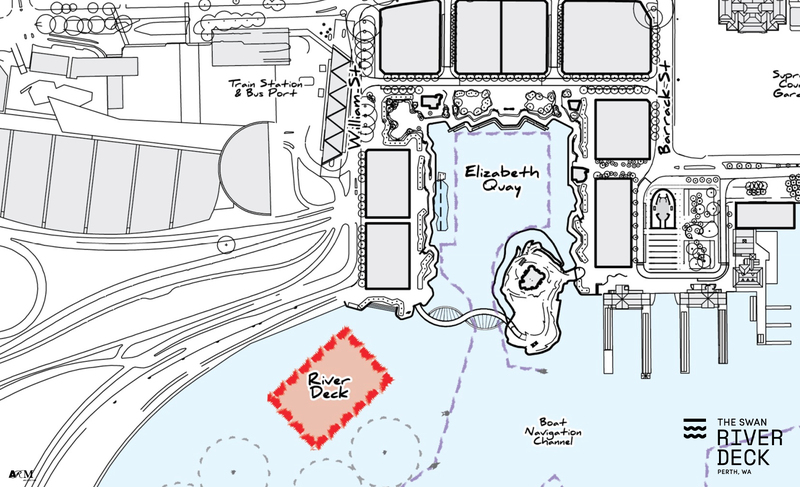 We're aiming for the financial and ownership structure of the River Deck to make access as affordable as possible. Constructing and operating the Deck will create enduring employment opportunities. We think that a good site for the River Deck is next to the lovely Elizabeth Quay, in close proximity to the best public transport in the metro area and accessible to the many people who visit, work or live in the city. 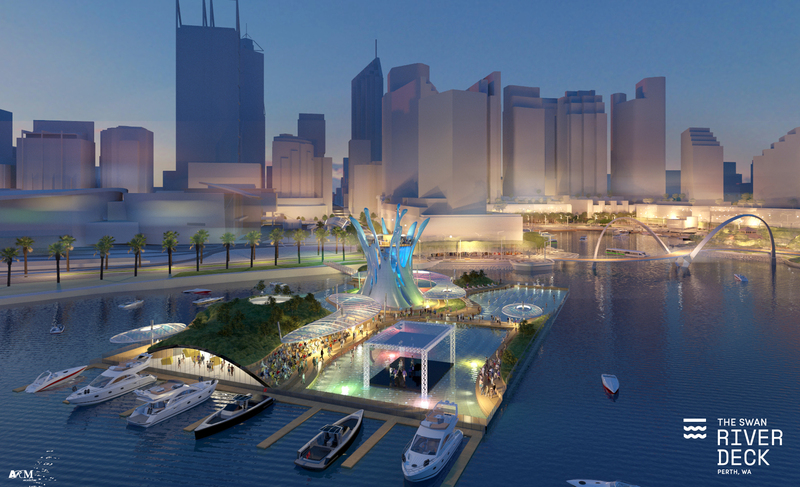 The River Deck will build upon the significant investment in Elizabeth Quay as a destination. We propose that the Swan River Deck could be accommodated at Elizabeth Quay in harmony with the proposed Indigenous Cultural Centre, to mutual benefit. Alternatively, subject to its final design, the Deck could be relocated to accommodate the ICC when it is built. Our team has spent many hours developing a preliminary view on what people may like to do at the Deck, how it could look, how it might operate (both technically and financially) and how it could be designed and built. We’re also in contact with the inspirational team at Plus Pool in New York City, and we look forward to collaborating on technology and sharing experiences with them. We’ve also met with a number of parties to seek feedback. These include the WA Minister for Environment; local Indigenous, business and community leaders; Tourism WA; the Metropolitan Redevelopment Authority; Landcorp; Tourism Council of WA; WA Department of Transport; SWALSC; Swimming WA and Committee for Perth.  As a next step, prior to pursuing regulatory approvals, we recognise that community endorsement is important for us to proceed further. We are at the early stage of this project and there is still much work to do. The final design & functionality will be shaped by you. Once we receive feedback from the public through the above channels and the WA Department of Biodiversity, Conservation and Attraction’s Perth Water Precinct Plan public consultation process, we’ll move things ahead.